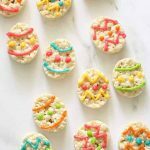 The best cookie decorating recipes! Cut-out sugar cookies, royal icing. If you plan on a lot of cookie decorating in the future, pin or bookmark this page. Here you’ll find the BEST cookie decorating recipes, including cut-out sugar cookies, royal icing (sugar cookie icing), and buttercream frosting. 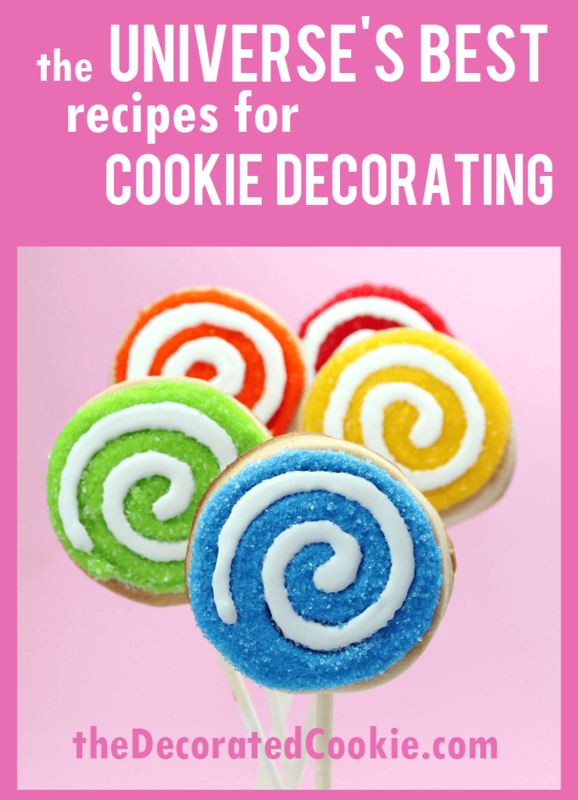 This collection features the best cut-out sugar cookie recipes for decorating, as well as my (I think, perfect) royal icing recipe. I also include a buttercream frosting recipe, which is great on cupcakes and cakes. 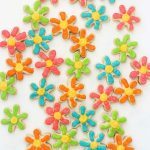 what are the best sugar cookie recipes? You won’t get too far in cookie decorating without trusty, no-fail, awesome cookie decorating recipes. Here are my top secret recipes that everyone else had to pay for when they bought Sugarlicious. My favorite, go-to, made-a-jillion-times cut-out cookies, royal icing and frosting are collected here in one place. I’ve used these for years. 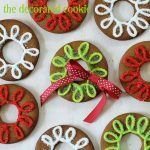 Now that you have your recipes, be sure to check out these tutorials for basic cookie decorating how-tos, all about food coloring, and where to find cookie decorating supplies. For tips on preventing cookies from spreading, click here. This is the best ever recipe for cut-out cookies. It holds its shape, freezes well, is easy to make and delicious. Cream butter and sugar. Add egg and blend well. Add extracts and blend. Mix flour and salt and gradually add. Cover dough with plastic wrap (I usually put mine in a gallon size Ziploc bag) and chill dough for about 2 hours. Don’t skip this. You must chill the dough. Working with about 1/3 of the batch at a time, briefly knead the chilled dough and roll about 1/4 inch thick. Cookies on a stick are rolled out 3/8 inch thick. Cut out shapes. Insert a lollipop stick about half way into the cookie, if using. Bake cookies on parchment paper-lined baking trays at 375 for 12-14 minutes. Thicker cookies may need up to 20 minutes. Just watch for edges that are nicely golden. MAKE AHEAD Notes: You can also freeze dough. After mixing, put dough in a gallon size Freezer ziploc bag (or wrap well) and freeze. Thaw overnight or for at least a few hours in the refrigerator in the ziploc bag. If too chilled to handle, let sit at room temperature for about 1/2 hour to 1 hour until it’s workable. Chilled is good, though, don’t let it get too mushy. To freeze cookies that have been cut-out and decorated, let the cookies dry overnight. Package in freezer-safe ziplocs in a single later and freeze. To thaw, remove from the freezer but keep in the ziplocs. Let the cookies thaw totally before removing from the ziplocs. Cream butter and sugar. Add the egg and vanilla and blend. Mix together the dry ingredients and gradually add to the wet. Cover and refrigerate 1 to 2 hours. When chilled, roll out on a floured surface, cut out shapes, and bake on a parchment paper-lined baking tray in a preheated 375 degree oven. Bake 8 to 10 minutes for small cookies, 10 to 12 minutes for larger cookies, or until edges are crisp. Thick cookies may need a few extra minutes. TIP: In lieu of flour, which may show up on the surface, you can roll cookies between two pieces of wax paper. Mix the flour, salt and spices together in a bowl with a whisk and set aside. In a large bowl with a handheld mixer or in a standing mixer fitted with a flat beater, mix together the butter, brown sugar and molasses on medium speed well blended. Blend in the egg and vanilla extract. Gradually blend in the flour and spice mixture. Wrap the dough and chill for at least 2 hours. (You can make the dough the day ahead and keep in the refirgerator.) Roll the chilled dough out on a floured surface to 1/8-inch to 1/4-inch thickness. Cut out your shapes. Place the cookies on a baking tray lined with parchment paper. Bake in a preheated 375 degree oven for about 12 to 20 minutes, depending on the size of your cookies, or until edges start to brown. Let cool completely before decorating. Mix the flour, baking soda, baking powder and salt together in a bowl with a whisk and set aside. In a large bowl with a handheld mixer or in a standing mixer fitted with a flat beater, mix together the butter and brown sugar on medium speed until fluffy. Blend in the spices. Blend in the egg, molasses and vanilla extract. Gradually blend in the flour mixture. Wrap the dough and chill for 1 to 2 hours. Roll the chilled dough out on a floured surface to 1/8-inch thickness. To make rings, use two different sized circle cookie cutters, sizes 3-inch and 1 1/4 –inch circles used here. Place the cookies on a baking tray lined with parchment paper. Bake in a preheated 350 degree oven for about 12 minutes, or until edges start to brown. Let cool completely before decorating. To make cookie pops, roll out chilled sugar cookie dough about 1/4-inch to 3/8-inch thick. 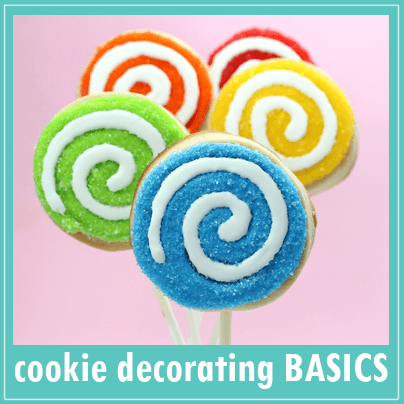 Cut out your shape, insert a lollipop stick into the cookie at the base, centered in the cookie’s thickness. Press the stick about half way into the cookie. No stick should poke through the front or back of the cookie. Pat the cookie’s shape back in place with your fingers, if necessary. Place the cookies on a parchment paper-lined baking tray, and bake according to the recipe. Cookies may need a couple extra minutes of baking time, since they are thicker. Make sure the sticks don’t touch each other or other cookies when placed on the baking tray. Combine flour, baking soda and salt and set aside. In saucepan, heat together butter, sugar and water and bring just to a boil. Remove from heat and stir in 1 cup of chocolate chips and the vanilla. Transfer to bowl and beat in eggs, one at a time. Gradually blend in dry ingredients. Stir in remaining chocolate chips. Pour into greased 9″ baking dish and bake in a preheated 325 degree oven for 30 to 35 minutes. Note:This sugar cookie icing is similar to traditional royal icing, but I add shortening and flavoring to make it taste delicious. Thus, it dries hard enough to handle and pack when left overnight, but not rock hard, like traditional royal icing. The consistency is NOT the runny kind used for flooding. It’s stiffer. Take a spoonful, turn it over the bowl. The frosting should cling to the spoon and slowly fall into the bowl. That’s the right consistency. You may thin this icing with water to make it the right consistency for flooding. Use royal icing (sort of) for cookie decorating. Whip the meringue powder and water on high speed for a looooong time, several minutes, until it’s fluffy and peaks form (use an electric hand beater or the wire whisk of your standing mixer). Gradually add the rest of the ingredients to desired consistency. Store at room temperature in a sealed container for up to a month. Cream the butter with a mixer. Add 3 cups confectioner’s sugar, 1 cup at a time, blending well with each addition (mixture may be dry and crumbly). Add 3 tablespoons milk and vanilla and blend. Blend in remaining confectioner’s sugar. Add more milk (about 3 tablespoons) until desired consistency is reached. Add more milk to thin and more sugar to thicken. Use recipe above, but add 1/2 cup unsweetened cocoa powder and a few additional tablespoons of milk, as needed for desired consistency. 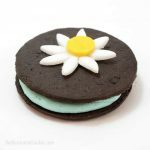 For a vegan version of cut-out cookies and cookie decorating icing, click HERE. Really, they were good. Really good. And I tried a lot of vegan cut-out cookies that were not good. Below find some metric conversions after a reader wisely requested them. But some disclaimers: I made these conversions based on internet research (with the understanding that recipe conversions are not straightforward mathematics, and different ingredients translate differently). I don’t cook with these measures, so they’ve not been tested. I have no concept of metric amounts. I need to see them to understand them and know how they relate to US amounts. Preferably if a reader were to invite me to their English countryside castle home to help them bake? I studied a wee bit at Oxford, and I do adore the area. A London suite would work as well. When I get a scale (hint, mom), I’ll test these, I promise. This was such a wonderful idea. I just had to post it on my blog (Swedenst largest interior design blog with over 30 500 scandinavian readers every week) to show my readers the link and picture of your lovely work! I love your book and use it for inspiration all the time. I especially like your idea of adding vegetable shortening to royal icing so that you get a creamier product. But I have two questions about this; one, how do you handle transporting cookies with softer icing? I have made dozens of cookies with your icing and moving them to the party is always a problem, or just displaying them at home. I have to buy a large coat box so I can put all the cookies on one layer. How did you all move cookies with soft icing? Do you have any suggestions? Second question; Crisco was reformulated a couple of years ago to omit trans fat (TF). But TF is what makes vegetable shortening work so well in frosting. I bought some high-ratio shortening at my local bakery supply store for my buttercream needs, but wonder if you think it’s necessary in your royal frosting. Thanks! Sorry for all the questions. I really do USE your book!! Thanks Susan R. for your great feedback! So glad you’re making good use of the book! Makes me happy to hear. Hopefully you’ll read this reply… VERY good questions. I do use this recipe (with the new Crisco), and handle the cookies, even wrap and ship them tightly packed with no problem, so hopefully we can crack down on why yours aren’t drying. Are you letting the cookies sit at room temperature overnight before handling? You can even let them sit 2 days (the cookies will still taste fresh) and put a fan on them, but they MUST sit overnight at least. I’ve never handled or packed cookies the same day I decorate. If that doesn’t help, or in addition, you can easily cut the amount of Crisco. Only use a couple tablespoons, and add a little light corn syrup, too, for consistency. It might be worth trying just a little (again, only a couple tablespoons) of your special shortening on a test batch, but I do think the issue might be the length of drying time. Hope this helps and keep me/us updated!! Meaghan, thanks so much for your response! Hmm… maybe I’m not letting them dry long enough before covering them. In Austin we have significant humidity most of the year. Uncovered baked goods become stale pretty quickly so maybe I’m just too quick with the Saran wrap out of habit. I’ll try a test batch of icing with a reduced amount of Crisco and the corn syrup and maybe put a fan on them but definitely leave them uncovered overnight. Thank you again for your suggestions. I’ll give an update and send a photo. Hi,I bought your book 2 cookie seasons ago. I make all my Holiday gifts – cookies and candy and cookies. I ship them to family all over the world. This is the second time I tried using thefrosting recipe in your book. I used Crisco the first time and yesterday I used High Ration Shortening. The same thing happened both times. I whip the meringue powder and water for a looong time until it is light and fluffy. Then I add vanilla, shortening and powdered sugar in that order. When I do this my light fluff goes down to a separated liquid. It does fluff back up but then as I am using the frosting, in bags, the frosting eventually separates and sometimes it runs out like a milky liquid. My cookies do not look like your cookies in your book. Any suggestions on what I am doing wrong is greatly appreciated. I am on my third batch of frosting and I still have over 1/2 of my cookies to decorate. Hi there, I'm having trouble finding meringue powder, can I substitute egg whites? if so what measurement should I use? I also should note I live in NYC and we do not have any craft stores such as Michaels, Jo Ann's etc. Hi Katie! Great question, so I posted the answer with other questions I've received so others can see it. If you click on the question mark in the right side column over there, you'll see your answer on the top of the entry. Thanks! I made the chocolate cookies last week and have just taken a batch of the sugar cookies out of the oven. They are so good it is hard to get the family not to eat them before I can decorate them. Some are in sticks and others are odd shapes my daughter made. Have also added dried ginger, cinnamon, etc for some gingerbread men. Thank you and yum. I tried your royal icing sort of recipe, and it was a huge success! The icing was slightly glossy and made the cookies so tasty looking–and they indeed tasted delicious too!! They dried perfectly and withstood a trip to school with my daughter to share with her classmates. It’s wonderful to have a yummy “soft” royal icing that tastes good and dries hard. Thank you! It will be my go to recipe every time! Yay! So glad it worked out!! And I have to agree :). Seriously, I haven’t changed my cookie/icing recipe combo in years because it just works so well for me every single time. Thanks for letting me know! Thank you so much for the conversions….this is a great help..since I’m not from the States I have no idea how much a stick of butter would weigh….So again, Thank you!! I know this was asked nearly 7 years ago, but I though I’d give it an answer. Here in the U.S. most butter is sold in one pound boxes made up four, 4 ounce sticks of butter. Each stick is 1/2 cup. Our recipes usually go by the number of sticks needed. I hope this helps. 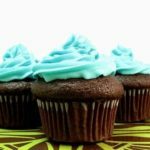 I just wanted to say THANKS again for this wonderful icing recipe! It’s perfect every time. My daughter and I made St. Patricks Day cookies with your recipe for cookies and royal icing. Superb! Thank you, thank you! thanks for sharing your recipes – I am surprised to see NO baking soda in the sugar cookie recipe, but there IS baking soda in the chocolate cookie recipe. Is that a mistake? Or is there really no soda in the plain sugar cookie recipe??? Thanks Susan! We already talked about this over at facebook, but I’ll answer here, too, in case anyone else has the same question! Most traditional sugar cookies DO have a leavening (like the chocolate cookie recipe, more traditional). However my “sugar cookies” are technically more like shortbread cookies. I loooooove the taste, but it is more buttery and shortbready and less sweet than a traditional sugar cookie. But the bonus is that they keep their shape beautifully, so perfect for cut-out cookies. I should really come up with a chocolate version of the non-traditional-sugar cookie, because I just love that sugar cookie recipe. I have the same question as another reader. “I’m having trouble finding meringue powder, can I substitute egg whites? if so what measurement should I use?” and can’t seem to locate the question mark that you mention… Can you post the answer or the link to the answer? Thank you so much for your insperation! Yes, I’ve been asked this quite a bit, and I’ve answered before and have no recollection where 🙂 ! Great question. While I prefer meringue powder because I don’t worry about the raw egg/storage bit (though icing has been made with egg whites for centuries, and the salmonella risk is very small), you definitely can sub. egg whites. I know meringue powder is not widely available in many places. Instead of the 4 T meringue powder and 1/2 cup water, I would sub 3 egg whites. You can also add a bit of lemon juice to the icing. Add your powdered sugar slowly until the consistency is reached, so 2 cups, then another, then 1 more cup and 1/2 cup at a time, in case the ratio isn’t exactly the same. Hope this helps!! Thanks so much. Hi! I was just wondering about how many cookies you get out of one batch of sugar cookie dough? I know the size matters of the cookie, say about a 2inch or so round cookie? We love shortbread and am looking forward to trying this recipe for our cookies. Thanks for your help! Hi Lisa! Good question… I realize I put this in Sugarlicious, but not here. You’re right, it depends on the size of the cookies and how thinly you roll them. If you add sticks, you have to roll thicker so you’ll get less. But for about 2-inch cookies you should get b/w 30 and 40. Bigger than 2 inches, closer to 25 or 30. But if you need around that much, I would make 2 batches just in case, then if you don’t use one, freeze the dough. hola, gracias por compartir tus recetas, quería preguntarte, yo no consigo merengue en polvo, es lo mismo si pulverizo un merengue comprado? Hi!!! I have a question…when I pipe on a dark color over a light background on the cookie over night it starts to bleed and has a tie dye afect on the lighter color. Like if I flood white and let dry then put black lines the next day it sinks in to the white in a mater of hours after it dries. Is there a way to prevent this? Hi Michelle! The bleeding icing thing is a problem that plagues many, sigh. Black is the worst culprit, especially in humid climates. I don’t have the problem too often, but I’m not entirely sure of the science as to why it escapes my cookies. Some things that may help: 1. Use good black food coloring, preferably Americolor Soft Gel Paste Super Black (and Bright White for the white icing), though this has also happened to those that use Americolors. 2. Unless you’re going for the sink-in effect, let the white flooded icing dry overnight before adding the black lines, and if your house is hot, you can even put a fan on it. The more dry the separate colors, the less bleeding. Which means it can take a couple days to decorate cookies. 3. I tend to go for thicker icing than most, for both my flooding icing and my stiffer, outline and detail icing. Using less water I think helps with the bleeding. If your icing is sinking into the white in a matter of hours, it may just have too much water or is in too hot an area. When I flood, my icing is thick enough I usually have to use a toothpick to encourage it to spread to the corners, it doesn’t flood there on its own. Earlene, do you mean in the royal icing? Regardless of the Crisco in the royal or butter in the buttercream, do NOT MELT!!!!! I add Crisco as is, for the buttercream frosting, I do soften the butter. The bubble thing is common, though theories are mixed as to why. I rarely see bubbles in mine and I think it’s because I make my icing thicker than most do (which means flooding isn’t quite as easy, you have to encourage the icing a bit), but I think it helps. I do use gel paste food coloring, though, americolor soft gel pastes. So I’d say try adding less water or more powdered sugar so the icing is a bit thicker. Meagan, yes, I was referring to the royal icing. I asked about melting the Crisco because this last time I saw some “lumps” and wondered if the Crisco was not soft enough. But on second thought, I’m wondering if I should have sifted the powdered sugar. Thanks for your prompt response and I will try making the icing thicker next time. Ah, yep, I’m guessing it was the powdered sugar. I never sift (out of laziness), but I remember those lumps occasionally when I worked at the cookie store. The domino’s sugar works well for me without sifting. Meaghan, thanks, I’ll try Domino next time. I had visions of my guests biting into tiny clumps of shortening, LOL! I am a new cookier and very addicted. I am still on the hunt for icing that work for me and my needs everytime. I have tried traditional royal and don’t care for the rock hard crumbly texture. I was using a Modified that calls for butter. Which I had been happy with until I tried it with darker coloring and it really does show any separation, but I have never whipped the water and m.powder til fluffy. I just pour everything into the mixer. I also am finding in the summer months as the icing dries there is a oily film on the top of that shows finger prints gets on the bags when I packaged them. Not pretty! Do you have that problem with shortening too? Is that just the downside of a softer royal? I love this recipe for royal icing (ish). The beauty is that it does dry well enough to handle and package and stack and ship, but not so rock hard it tastes terrible. I’ve found no problem with using Crisco (but you can reduce the amount or eliminate it, too). But when thinning my icing for flooding, I err on the side of too thick. I always have to encourage it with a toothpick to fill my spaces. And let the cookies dry uncovered at LEAST overnight. In humid summer months, maybe even up to 2 days, and it helps to put a fan on the cookies. And then package them after they’ve fully dried. You shouldn’t see any film! I was wondering what measurement is 2 sticks of butter? I would live to try your cut out cookie recipe but I am unsure how much butter to use. Loving your website all the way from Australia! how long does the royal icing last in the icing bag? Marni, I’ve used mine up to several weeks after preparing and bagging, left at room temperature. I keep all my prepared frosting bags in a Tupperware container. If the icing looks as though it has started to separate, though, blech, I’d toss it. Ola vc não usa fermento na sua massa de biscoitos!!! Can you make the cookies ahead of time and freeze for a couple of weeks?? Absolutely Wendy! I’ve done that plenty of times. It helps immensely to break things up when you have tons to decorate. I roll out, cut out and bake the cookies. Then just stack and freeze in freezer-safe ziplocs (same way I freeze the decorated cookies), then let them thaw totally in the bags so moisture doesn’t collect, then decorate as usual. Works really well. In fact, I’ll freeze at any step… I’ll freeze the dough, the baked cookies, and decorated cookies! Just made your sugar cookie recipe. Awesome! I can’t rave enough about the balanced simplicity of it.It’s everything it should be light, as crunchy as it should be not a hint of a floury feeling ,delicate yet not crumbly. I could go on and on. Used 1 1/2 tsp almond extract and just 1/2 tsp of vanilla extract as I had run out and that’s the way to go.I might experiment with adding butter flavor as I looove butter. A heartfelt thanks for sharing!!! Thank you thank you thank you Sissy!! And I so agree. 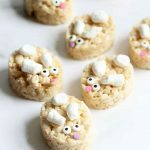 Because I often make these for kids, who sometimes have an aversion to the almond flavoring, I end up rarely using the almond, but I like them MOST with the almond. Can’t be beat. Your description is perfect, too :). Good question Zori! I know elsewhere in the world light corn syrup isn’t as readily available. While ordinarily in baking you can sub honey, in royal icing it would tint the icing too much. Corn syrup isn’t necessary in the recipe though, you can omit it entirely. I use it because it helps with the texture a bit, but so does the shortening. Thanks for the quick response. I got the idea behind the corn syrup and I think it’s really great to soften the icing. Honey sounds nice. I’ll give it a try. Hi…I usually don’t comment on blog posts but for this one I just HAD to!!! My first attempt in making sugar cookies was a complete FAIL (it wasn’t your recipe) and I said, never again! That was about a year ago. I came across your blog and the way you explained things made me want to give them another chance. I made the cookies yesterday…best sugar cookies EVER! They’re easy to make and your directions are very clear. However, it’s quite hot where I live and even though we have the ACs on, my kitchen gets warm…so I had to keep popping the dough back in the fridge to chill it. But I loved it…and I will be making them again today!! And the Royal Icing (sort of) recipe…I really don’t have words to describe how I felt towards this icing…it worked out perfectly!!! The consistency, the taste…and like i said, ACs on all the time so they dried pretty quick. I just need to practice more on piping the icing. Yesterday, because I was so excited about the way the icing turned out, my hands where literally shaking as I was trying to pipe it!!! :))) Thank you thank you thank you!!! Woohooooo Tuba!! Best comment to wake up to ever! 🙂 So so glad it worked out for you, and yep, I hear you about the AC thing. In the summer the same thing happens in my kitchen!! 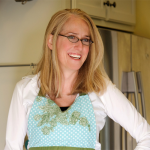 My sister-in-law recommended your book and site to me last year, and I’ve had a ton of success with your recipes. I was reading the comments and saw so many people that had trouble finding Meringue powder. I’m currently living in Africa and can’t find powdered sugar in grocery stores, so definitely no meringue powder. I ALWAYS order it from Amazon. They have several brands. Hope this helps! Thanks Kim! That definitely helps. I take for granted that I have a craft store 20 minutes away that always has it stocked, but it’s much harder to find around the world. Good to know about amazon! That’s the brand I use, too. Great recipes! I’m the “cookie lady” at work, in fact, have baked two batches nearly every week for a staff meeting for years. (So, am a really confident cookie baker.) But whenever I’ve tried making decorated sugar cookies, seems like I’ve beaten my head against a wall battling the royal icing, not getting the thickness right. Have spent lots of $$ for all the right tools, etc. Wound up with rock-hard chalky globs that look like a little kid made them. Would stay up half the night only to throw the mess out. Today’s Halloween, and after staying up way too late the last two nights I actually had good tasting cute cookies that got raves at work today! Your shortbready recipe is perfect, not too heavy, not puffy, held the shapes. Not too sweet, so with the frosting it was perfect. The almost royal icing worked so much better! Dried just hard enough. Among other things, made some of your monsters. Very fun! Am still trying to get the knack but now think I can try tackling some Christmas cookies this year. Thanks so much for sharing these recipes and pictures! Thank you Melissa!!!! You hit all the nails right on the head with exactly what I love about those recipes (and I know your other woes with the fails, too, boy do I know!) So so glad it worked out for you :). 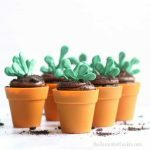 I have been using your icing recipe for about two years now and I love it!! It is the only RI that actually has a good taste! While I really do love the recipe I always have annoying little lumps in my frosting. This doesn’t seem to change regardless of whether or not I sift the powdered sugar. The lumps are big enough to block the #2 piping tip… which makes decorating a total pain as I have to stop every 30 seconds to get a toothpick to clean out my tip. Have you heard of anyone else having this problem?? While for some reason I don’t have that problem, I know what you’re talking about… and even though you sift the powdered sugar, it’s still curious, because that’s usually the culprit. It could also be the meringue powder, though. What brand do you use? I use Wilton. Are you using just powdered egg whites or meringue powder? I use wilton meringue powder as well. I really don’t know what the problem could be, and I have made this recipe many times and always have the same issue. I even use an electric sifter! I was just wondering how much icing this recipes makes? I am having 8 kids over for a cookie decorating party and wondering how many batches of this RI i should make? 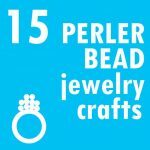 I’d like to make 8 different bags. Also- can i just use regular liquid food coloring you by at the grocery store? Really glad i found your site! One batch should make 6 to 8 bags of icing, but you can make them a little smaller for kids, so 1 batch should do. A lot of icing goes a long way. In fact, kids do better with a bag only half full, since it’s easier to squeeze. While I vastly prefer Americolor gel pastes for my decorating, for kid versions, YES, you can just use the liquid food coloring. You may need to add a bit more confectioner’s sugar if it makes the icing runny. Hi meaghan. Thank you so much for your website and book. I love it! I have a question about the chocolate cookie recipe for cookie cutter cookies. Will the dough spread while baking because of the baking soda? Same question for the ginger bread cookie recipe. Hi Desiree! While my regular sugar cookies don’t spread an inch, I do find that the chocolate do spread slightly. Gingerbread less so, but I tend to roll those thinly. I’ve never made cookie pops with them, so haven’t had to roll them more thickly. Hi meaghan. 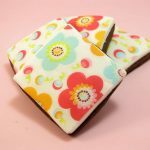 Willtge recipe for chocolate cookie cutter cookies spread? Hi Meaghan! I love your icing!! I would like to make it into a chocolate icing for some donut cookies. Would I add cocoa and substract icing sugar? Do you have any suggestions? Thank you! Hi Crazy Cookies! Egads! So bizarre… I’ve had two people contact me in the last week with problems with the dough after years of raves! I’ve made this dough thousands of times and it’s usually very forgiving. I’ve never had any issue and it’s turned out perfectly every single time. The other person had a problem with it being mushy, and yours is too crumbly, total opposite. I don’t know why it would crumble. Assuming you used two sticks of butter, softened, but not melted? And thoroughly mixed with the confectioner’s sugar (not granulated). And mixed in one egg. And added 2 1/2 cups of flour. I wish I had the answer. I can’t think of any cause for the crumbles unless you forgot the egg, but doesn’t sound like the case. Apologies for any inconvenience! Hi there, I,ve been using your version of royal icing for about a year now. I love they way it tastes. But sometimes when it dries over night I wake up to spots on the cookies. Any idea why or what I’m doing wrong? Finally a great sugar cookie recipe I can make my “go to” sugar cookie recipe!!! Thank you! thank u for recipes and conversions and just wait to make some for Halloween!! 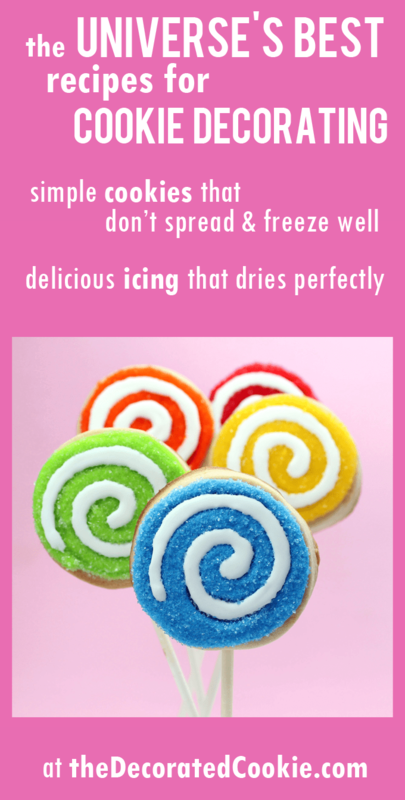 Easiest and best tasting sugar cookie recipe ever! Husband said they are better than bakery cookies. Also loved the Royal Icing (Sorta) recipe. First time ever making it and it turned out perfect. Thank you for sharing these recipes. Aw… and yay! Thank you so much Lorilai! So glad they turned out! I’m newer to cookie decorating. I tried your Royal Icing (Sortof) recipe & love it. It’s the only one I use. Any idea how I can make this into a chocolate royal icing (sortof)? I’d like to cover my easter bunny cookies with a chocolate icing. Thanks so much. I have your book “Cookie Sensations” and really enjoy it. I know everyone is going to online/ebooks, but I still like my books!!! I have lots of sticky tabs in it. Thanks so much for your kind words! I’m with you about the ebooks. I’ve gotten into reading novels on the kindle, but I just can’t do the cookbooks on kindle yet. I somehow, someway have never tried to make a chocolate royal icing (note to self: Make a chocolate royal icing), but you should just be able to add cocoa powder to the recipe. Cocoa powder is fine enough that it should dissolve well without altering the consistency too much (and you could also add more water or even milk to thin if needed). I would start with maybe 1/2 a batch, or even 1/4 of a batch and stir in 1/4 cup at a time to taste or darkness. Hope this helps! If it works well, let me know :). Oh my goodness, I’m in love with these 2 recipes. They’re perfection! My question: Is your Royal Icing (sort of) a cookie preservative like traditional RI? Will it keep my (your shortbread-ish) cookies preserved for up to 4 weeks like traditional RI does? Hi Julia! Yes and no. While I know those that have eaten my cookies weeks after receiving, I wouldn’t say they are at their optimal freshness by then. I always say 1 week is best, but they will go about 2. Do I have to use the shortening in the icing? I don’t have any Cisco but I have everything else and I don’t want to have to go to the store for just that! Hi Terra, nope!! You can easily leave out the shortening. I like what it does to the texture/taste, but it isn’t a huge difference. Hi Alanna, if you are using very thin icing for the white part, I would let it dry for a few hours, then add the red and then let them sit overnight to fully dry. I am sorry to bother you, but I am unsure of an answer you gave. They asked if they could substitute egg whites for the meringue powder, my question is, was your answer for your plain royal icing or was it for your royal iciingish. I am a totally newbie to this cookie decorating thing. I have not made any icing yet, just your cookies. Which are great. I want to make sure I understand so I have less chance of failure. Hi Suzie, great question! Traditional royal icing uses egg whites, vanilla extract and confectioner’s sugar. It’s the standard for cookie decorating and especially gingerbread house making because it dries very hard. However, I find it’s TOO hard for my tastes. My royal icing”ish”, I call it that because it acts like royal icing (in that, it’s great for cookie decorating and dries hard enough to wrap and handle) but I add other ingredients to make it have more flavor and to give a bit more. So, instead of egg whites, I use meringue powder, and I add crisco and light corn syrup. It’s my all-time favorite recipe for cookie decorating. That said, in my royal icing-ish recipe, which calls for meringue powder, yes, you CAN use egg whites instead (although I prefer the ease of meringue powder, which is available at the craft store, and some supermarkets sell it too). Meringue powder is just a combination of dried egg whites and cream of tartar, which is a stablizer. So if you do sub egg whites, add 1/4 teaspoon of cream of tarter, too. And PS, I love cookie questions, so if you have any more along the way, feel free to ask in comments or even email me at theDecoratedCookie@gmail.com! Which recipe was used for the Monster Cookies? Sorry. I assume it is the sugar cookie recipe. Is the recipe for the monster sticks the sugar cookie that is put on a stick??? Yes!! That’s the one Sue! It’s the best for cutting out cookies precisely with no spreading. I just had a quick question as to (roughly) how many cut out cookies you can get from each batch. I am having about 15-20 adults over for a decorating party and want to make sure I have enough! I was thinking of doing 1 batch or sugar, chocolate, gingerbread and a brownie. thank you! Hi! It depends on the size of the cookie cutters. If you’re using the big cutters (6 inches or so), only about 15. Medium size cutters(2 to 4 inches) you’ll get about 25 to 30 per batch. So I think you’ll be fine with one batch of each, depending on how many you want each adult to decorate.